Looking for the Best Way of Getting to the Cangrejal River Valley? The Cangrejal River Valley is one of the most unique areas in Atlantida. For that matter, it is one of the special spots in all of Honduras and Central America. Best of all, getting to the Cangrejal River Valley is actually quite easy! Since the area is just outside of La Ceiba, you will first need to get to this city. Fortunately, it is actually very easy. From the Bay Islands of Utila and Roatan take either the ferry or a flight to La Ceiba. From San Pedro Sula and Tegucigalpa you can fly or take a bus directly to La Ceiba. 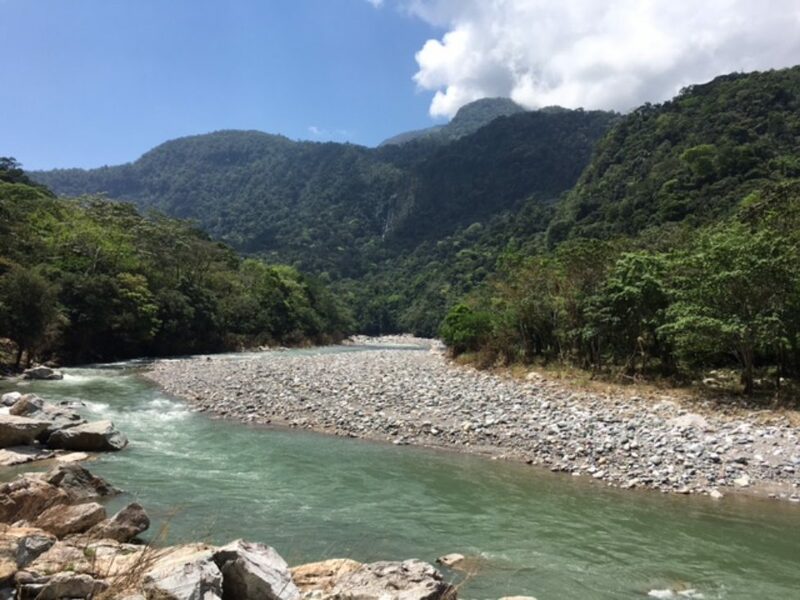 Once in La Ceiba, you will need to drive up a dirt road which is known as “carretera a la Cuenca del Cangrejal”, which means road to the Cangrejal River Watershed. This is an all weather dirt road. Although any car can get you up the road, a pick up truck will make the trip a bit shorter in time. Most of the tourism related businesses are between kilometers 6 and 9. It should take you less than 30 minutes to get to any hotel in the valley from downtown La Ceiba. To find this detour, take the CA13 highway leaving La Ceiba towards the east, in direction of Trujillo and Tocoa. As soon as you pass over the Cangrejal River Bridge, which is locally known as the “Puente Saopin” you will find a road leading towards the mountains. Take this detour and it will get you straight into the Cangrejal River Valley. If you are coming from the ferry terminal, follow the road out of the port facility until it t bones with highway CA13. Take a right, and then just before you go over the Saopin Bridge take a left, towards the mountains. You can catch one of the local buses that travel to the towns and villages upriver from this intersection. The cost of the ride to your hotel will be close to $1 US dollar in local currency. Take note that the last bus goes up the road around 3:30. After that time you will either have to hitchhike or get a cab to drive you up. Most of the hotels in the Cangrejal River Valley will either provide transportation or help you arrange for it with a reputable taxi driver. The cost of the transfer from the Ferry Terminal to your hotel in the Cangrejal River Valley should be no more that $25 US for the ride, which can be from one to four persons in the car. Getting to the Cangrejal River Valley from the airport will be more expensive, but do not pay over $40 US. Finally from the bus stations in town, you can get a cab that should be no more than $25 US.